A story of a place lost and one about to be found again. Mourning somewhere gone, with photographs found years ago in the Liverpool Central Library, which opens its doors once again, this Friday. The Library closed for major regeneration works three years ago. And since then, its archive of historical photographs has had to be held in storage while the works took place. But all is now ready, the books and archives have been moved back in and the doors of our beautiful looking new library are about to open. I can hardly wait. But for now, let’s go back fifty years or so, for a story of a time when Liverpool took to calling itself the ‘City of change and challenge.’ Newspaper headlines about things like the ‘Shankland Report’ and even our franked envelopes throughout the 60s bore this heady title. I was a small boy then and had grown used to living in a city still scarred by the battering it had taken in the Second World War. But at long last, along with our pop singers and footballers starting to dominate their leagues and charts, it looked like our future was arriving. I wasn’t sorry. We went to a wedding in a social room of one of the new tower blocks in Everton just after it had opened. And I wanted to live there. The Echo told me the old houses they were pulling down by the thousand were ‘slums’ and needed to go, and I believed them. Because I was part of the future too, and the future was clean and new. As the 60s went on I did start wondering why the motorway hadn’t arrived yet. I’d seen the plans for something called the M62 sweeping into the city centre and couldn’t imagine what was keeping them. I was young and naive, of course, so didn’t pause to think about the level of destruction a road and a tunnel like that were going to cause. And for the same reasons, I hadn’t noticed that the needs for such a road were disappearing. The ‘City of Change and Challenge’ was in trouble. Docks were closing, jobs were disappearing. Here, preparations were made for the future. 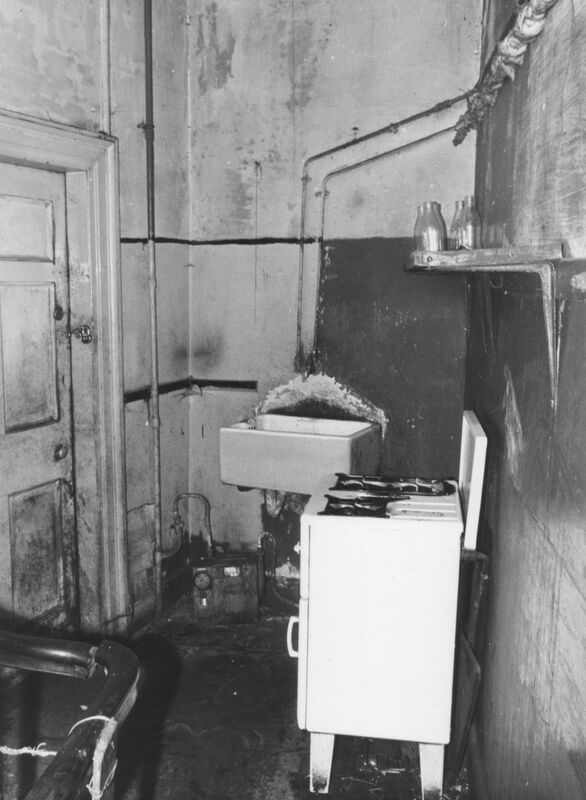 Homes were condemned, allowed to degenerate and cleared. For the new motorway. In streets that would have looked a bit like this if they were still with us today. Because the truth is, our Canning area of glorious Georgian Streets used to stretch further and wider than it does now. Along Upper Parliament Street to the Lodge Lane crossroads. 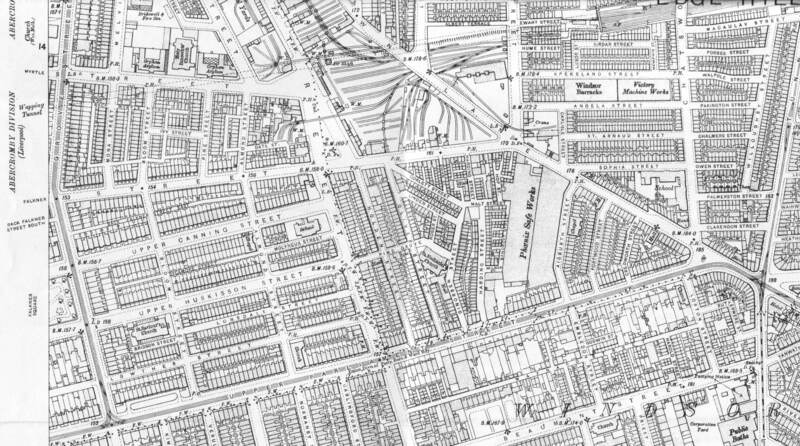 The ‘Ghost Streets.’ On a modern street map follow Falkner Street (marked), for one, and you can see where it used to go by the fragments of it still left. Ghost streets. The 1905 O.S. map shows Upper Canning and Upper Huskisson Streets. And Falkner Streets running up to Smithdown Lane. These photographs, mostly from the Liverpool Central Library show what it looked like. All taken in 1965 and 66. 146 Canning Street. Canning Street now stops at 78. 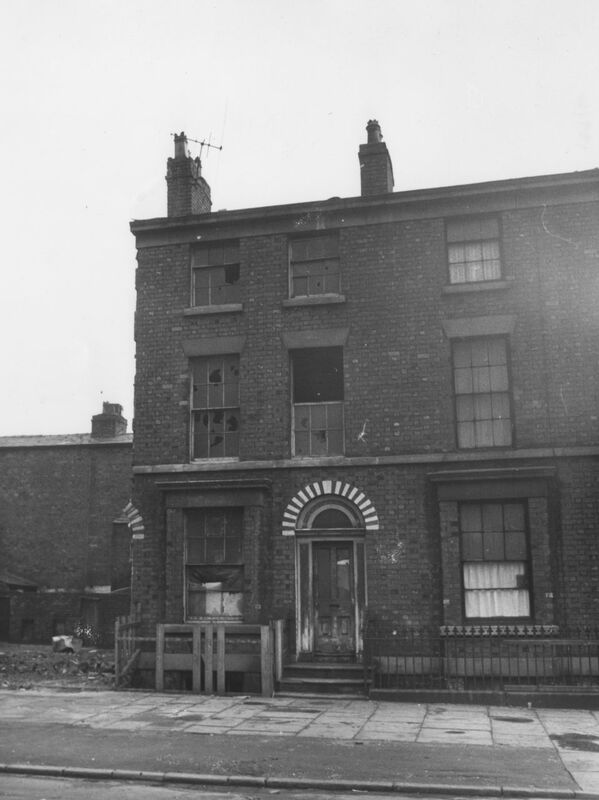 65 to 69 Falkner Street. 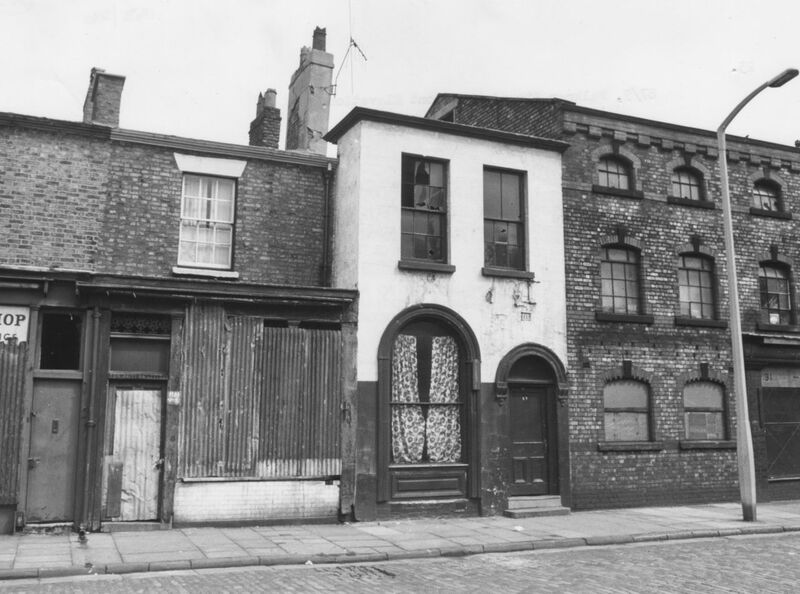 Beyond where the street still recognisable as Falkner Street now ends. 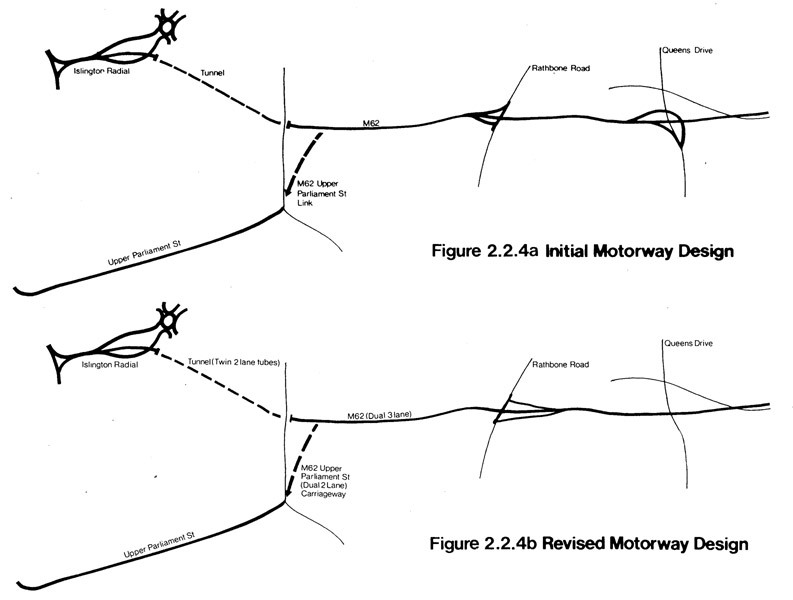 As the 1960s turned into the 70s the abandoned ‘Motorway’ plan turned into an ‘Inner Ring Road.’ Which still required the obliteration of what you see here. 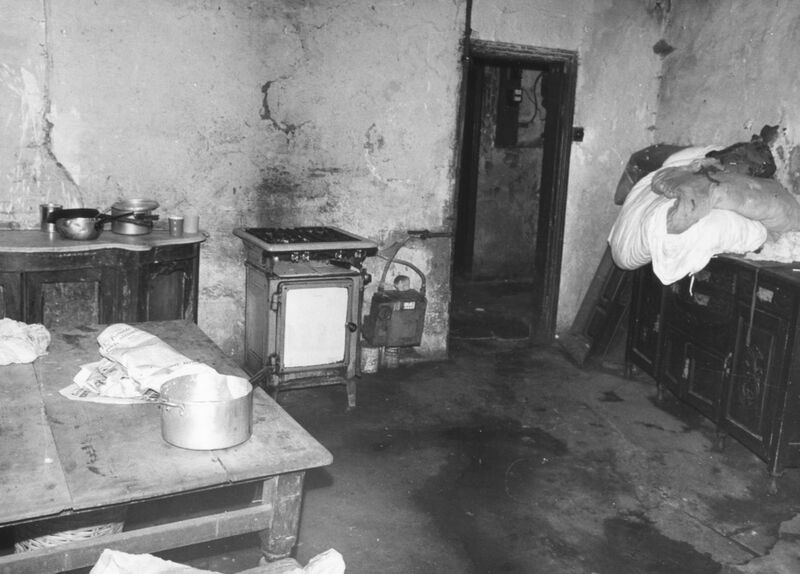 And people lived on in desperate conditions. Partially condemned, the whole area, including what was later saved declined steeply. 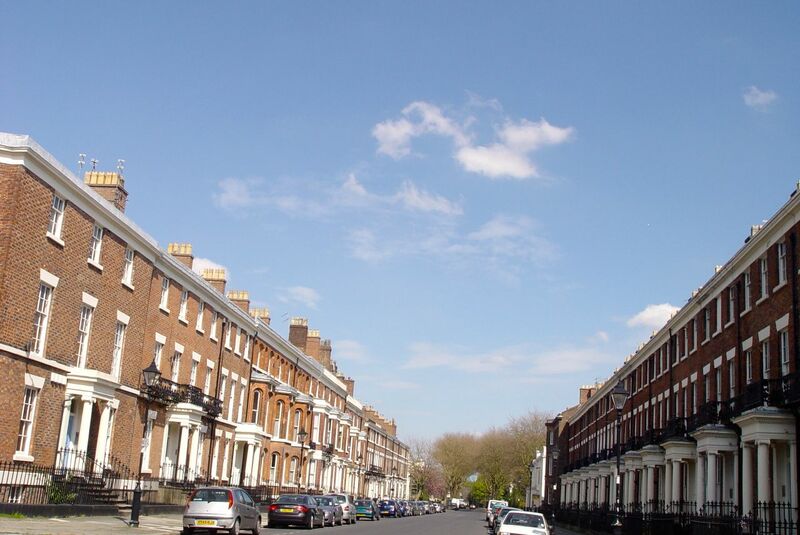 This was Falkner Square before Liverpool Housing Trust renovated it. 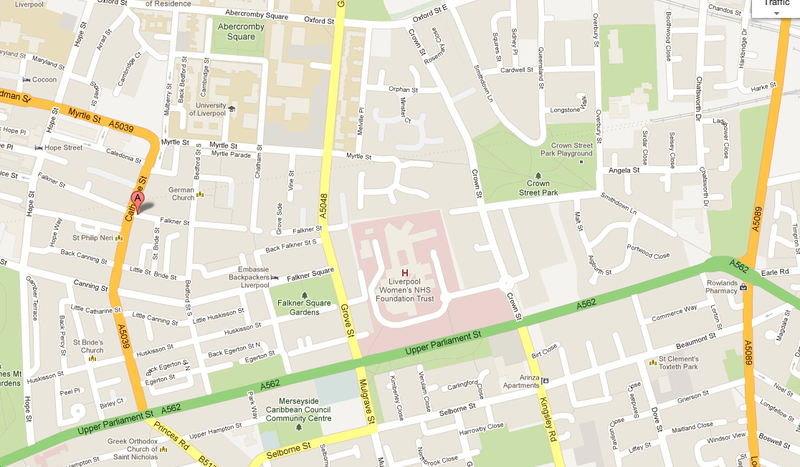 I first walked along Canning Street and into Falkner Square in 1973 when I started at Liverpool University. And it was clear to me then that the future had stalled. 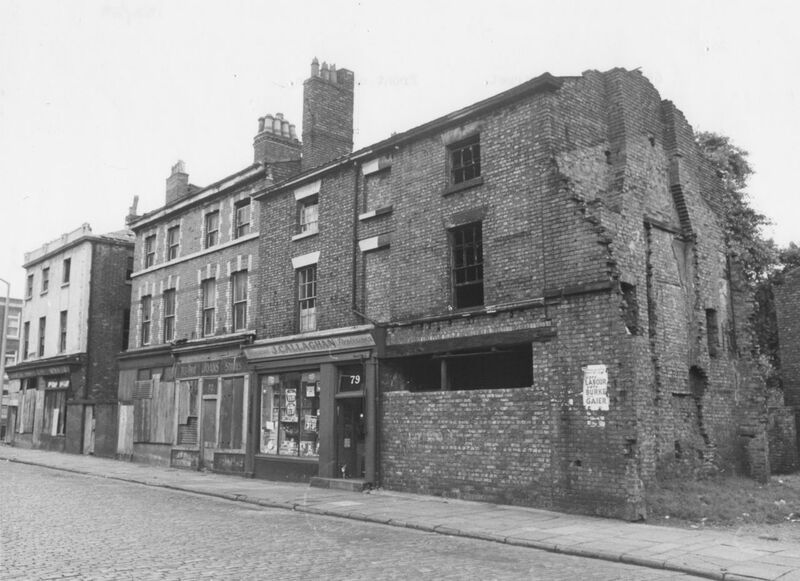 Then one day in 1974 I remember me and a couple of friends borrowing a van to go and pick up a piano from the ‘top end’ of Falkner Street. The owner was getting rid of it because she was finally leaving. Her house was being demolished the next week. The days of ‘upper Canning’ were over. 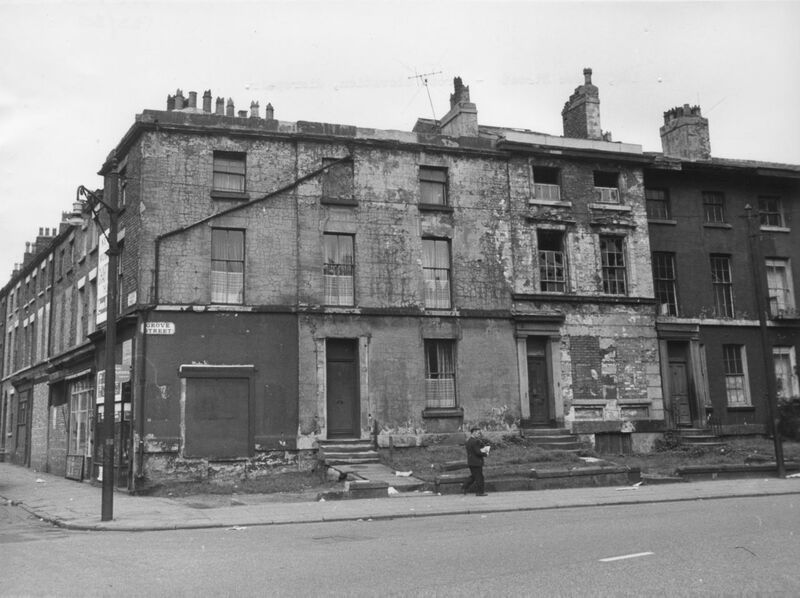 By the end of the next year I was working for Liverpool Housing Trust and we were doing our best with the area of Canning that had survived. And only last week I so enjoyed walking around its sunny streets. And of course we’ve moved on. A city recovers. Like from a bruise, an injury, a bodily loss. We move on, we have to. But we don’t forget. And sometimes we need to tell the story of what happened here. And after tomorrow, when the great library is open again, more stories will be able to emerge. Of lives lived, things lost and things gained. In the city of change and challenge. The Library will open at 10:00 tomorrow morning, 17th May. And be part of the Light Night Liverpool celebrations until midnight. What stories have disappeared for ever with those demolished houses? Fortunately we now have photographic records of buildings and places and archival facilities to preserve the records thanks to libraries. 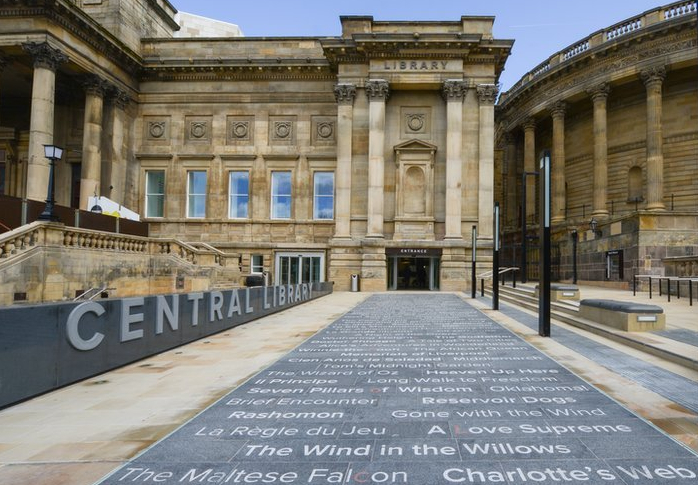 I like the pathway of memorable book titles leading to the entrance of this great library. Also I’m happy to see Charlotte’s Web and Wind in the Willows on the path…. Also, thanks to the library and its users the stories can emerge! No doubt the library will be packed all day tomorrow, though I will go after we’ve finished working. But I’m looking forward to a good quiet day for a proper look around! Hi Ronnie, I find it so puzzling verging on insulting as to why they demolished such perfectly good housing stock. Granted it was in need of renovation and an amount of modernising internally. But they knocked them all down and built slums. Even Hitler couldn’t cause the demolition that the council achieved. Why indeed Stan. Especially when the things that were then built, the Falkner Estate and Entwistle Heights lasted barely a generation. 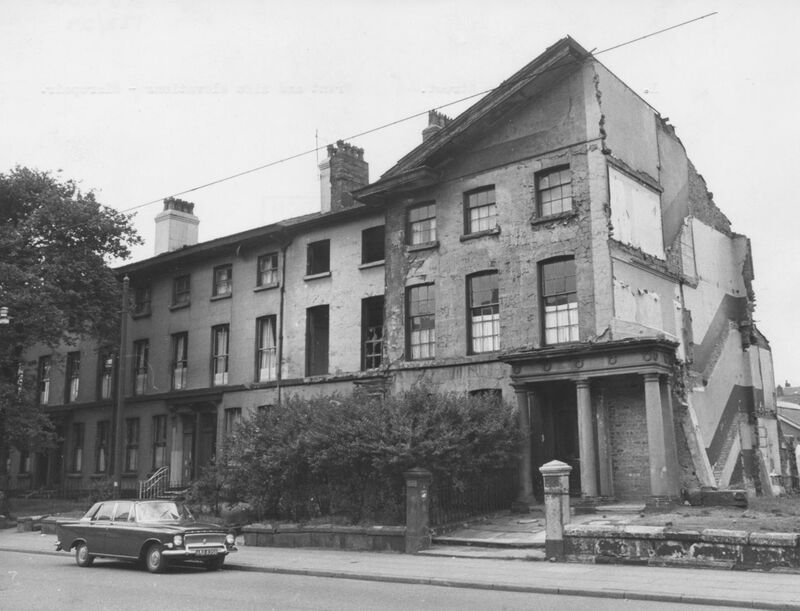 I’d like to say ‘It was a different time and we’ve learned since then’ but the disaster of the Housing Market Renewal Initiative and the imminent demolition of much of the Welsh Streets here in Liverpool suggest not. Thank you for this very interesting post which contains poignant personal reflections, together with excellent maps and photographs. I look forward to diving into the library and resuming my local history researches in the archives section. Thanks for the links Stephen. The naming of books and authors is very powerful isn’t it? There’s going to be some kind of celebratory projections of book shelves onto the new library later this evening. I’ll be there. Sorry I can’t be there as well. I look forward to coming down during the half term holiday. Brilliant post! I’m always fascinated and appalled in equal measure with what we destroyed, with our ambitions of the time, and with the conditions that people lived in during an era we think of as recent history, and which we associate with political and social ideals. 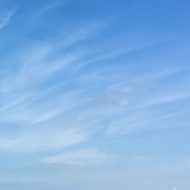 Sometimes I try to feel appreciative of what we have left, rather than regret what we have lost. You’re right Martin, we can’t bring the Upper Canning district back, so we need to – and do – celebrate the Canning that we have. But I like to tell the stories of what’s gone and how it went so people know. And so we might be more careful with what we have now. Just wanted to say thank you for the web site. By happy coincidence I was searching for a lost relative who happened to reside at 146 Upper Canning Street in the 1901 census and lo and behold you have a photo of his dwelling. So once again thanks. My relatives also lived at 146 upper canning street but at the 1881 census! Thanks for this Ronnie. I have been trying to find out about the NUPPO police and prison officers club that was on Upper Canning and things like this are very helpful as few records exist. 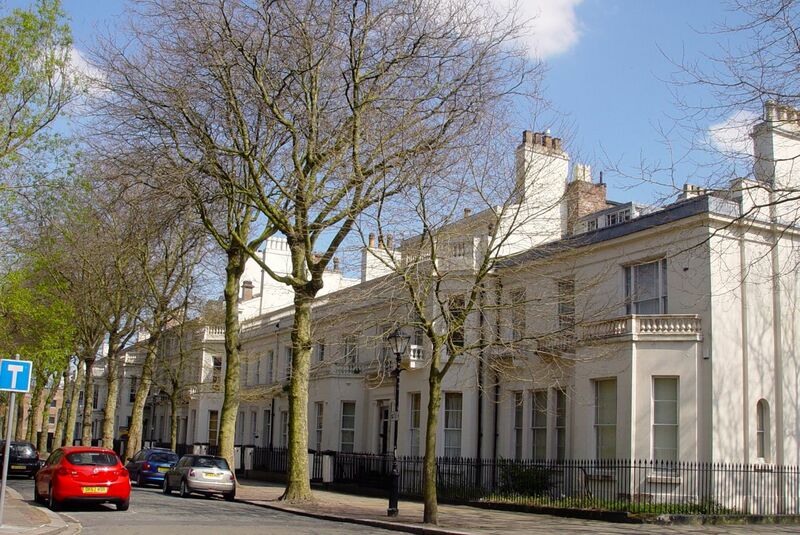 It is hard to believe how nice Falkner Square is now in comparison to how run down it sounds to have been. It is under the hospital site Keith. 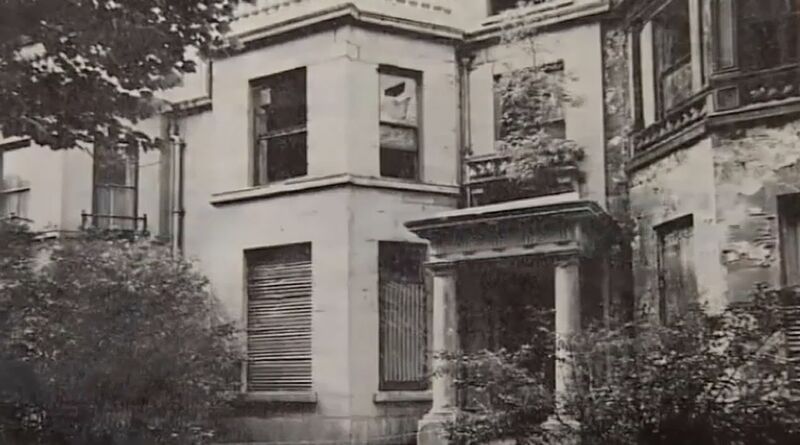 The hospital was built in the mid 1980s, following the demolition of the Falkner Estate that replaced your grandparents street.